Early Bird tickets offer up to 27 per cent savings if booked before the end of March. 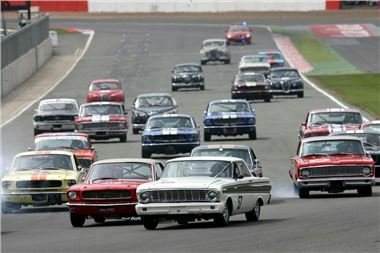 The days are numbered for those wanting to take advantage of the special ‘Early Bird’ ticket offer for the 2012 Silverstone Classic powered by the AA (20-22 July). Those booking before the end of March benefit from significant discounts of as much as 27 per cent when compared to tickets purchased on the gate – plus an additional ten per cent saving for those members of the new event partner, the AA. The finest classic historic racing carscovering a 70 year era featuring more than 100 Grand Prix cars plus massive 50-car grids of Le Mans, GT, Group C, mighty F5000, Formula 2, Sports and Touring cars providing the very best of nostalgic action in 24 flat out races. There’s even a celebrity race in Morgans with world famous TV chef Heston Blumenthal and famous friends. In excess of 7,000 classic cars on display over the weekend with huge anniversary celebrations for AC Cobra, Ferrari F40, MGB, Lotus Elan, Triumph Spitfire plus the UK’s first BMW Z-Fest. New AA World where everyone from toddlers to seniors can have a driving experience – free learner car taster lessons (age and height restrictions apply), circuit rides, skid pan, pit stop challenge and lots more. Live music concerts with headline sets from Mike & The Mechanics and Adam Ant plus full supporting bill. Off-track action with a vintage fun fair, go-karts, Punch and Judy (celebrating 350 years) plus giant TV screens showing all the action. There is even a pampering centre on the Village Green. Aerial displays with wing walkers, the Parachute Regiment The Red Devils, hot air balloons and more to be announced. Rally car and off-road 4x4 experiences. Festival accommodation alternatives on-site: modern campsite, glamping and the unique Snoozebox hotel for additional comfort over the weekend. Full details of the 2012 Silverstone Classic powered by the AA – including information on ‘Early Bird’ ticket offers for those booking before the end of March – are available via the event’s official www.silverstoneclassic.com website.